The Rassemblement québecois contre l’euthanasie (The Quebec Rally against Euthanasia) is a non-profit organisation whose mission is to counter any attempt to introduce (whether overtly or otherwise) euthanasia and assisted-suicide in the Quebec health care system. 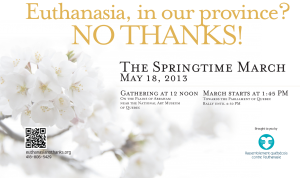 On May 18th, 2013, a large-scale March against euthanasia and for accessible and high-quality palliative care came about following the publishing of the Ménard report at the beginning of 2013. Citizens from all walks of life, concerned about the probable abuses that would come in the wake of a legalisation of euthanasia, formed the Quebec Rally Against Euthanasia and chose, as a first important step, to organise a citizens’ March to counter the legalization of euthanasia and assisted suicide in the Quebec health care system.